Ask most sales/marketing people and they’ll tell you, pitches are a numbers game. The more people you offer to, the more sales you’ll get. They aren’t wrong, it’s a statistical fact. If you ask more people, you’ll eventually get more sales. Let me be the first to say, I hate this strategy. It’s inefficient. Sales Guy: Hi sir, who do you currently have for cable? Me: Yep, we cut DirecTV almost a year and a half ago. SG: (Extremely surprised) Seriously?! Why? Me: Yep, we just didn’t use it enough. Felt it wasn’t worth the cost. Me: Are you guys with that new “Prism” system? Me: Ah. Ok. Nope, we’re good actually thank you. SG: Ok, have a great day! First of all, I respect this young kid for the one thing most sales people don’t ever catch…Not everyone is your target audience. Some would say he should have pitched harder. That he could have had me. The truth is, he’d never have me. I don’t want his product, and he was able to tell that from our short conversation. He knew to let me go. There were plenty of other people just behind me. If someone simply doesn’t want what you are selling, that’s fine. They may just actually not want it. At the end of the day, your time is money, and the quicker you can spot a mark that 100% is not interested, the more money you save. Stop investing time, energy (and money) in the people who won’t ever convert, and start focusing on the people who you can identify will. Seriously. I’m not. Just be smarter about your pitch. Let me tell you a cliche fishing story that totally relates to this idea of “catching the big one” (I have proof too). Yes, those teeth can cut a line in a heartbeat, and they usually do. I was told they actually hunt by just swimming with their mouth open and running into their prey…and slice them up. Scary stuff. Anyway, back to the story…there’s no way I should have ever caught this fish on this line. No metal leader, not the right bait. That day though, this particular fish decided it was time. And here we are. If you don’t ever throw the line overboard, you never know what you’ll catch. What kind of salesperson are you? Can you identify, and respectfully turn away, someone who clearly isn’t interested? Or do you keep pursuing? 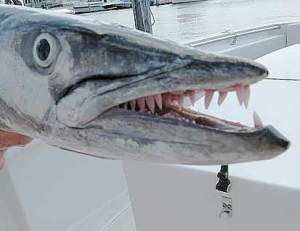 Editorial Note/Promotion: If you are ever in Tampa, Florida and looking to do some charter fishing, I HIGHLY recommend Capt. 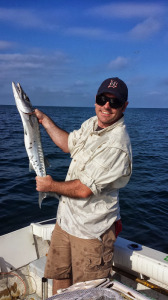 Brady Nelson of Bass N’ Bay Charters. No paid promotion, just straight up happy customer. Great Guy.